The primary publication of the Association for Borderlands Studies is the Journal of Borderlands Studies, published four times a year. It has, for more than a decade, distinguished itself as a leading forum for borderlands research. Widely consulted by educators, practitioners, and researchers, the journal encourages the submission of articles from disciplines across the humanities and social sciences as well as from allied fields. All published manuscripts are peer-reviewed. Since 2011, the Association for Borderlands Studies’s Journal is published in the UK by Routledge Journals, Taylor & Francis Group, Informa UK Limited. Libraries and institutional subscribers are asked to please contact their Customer Services at subscriptions@tandf.co.uk for pricing information. 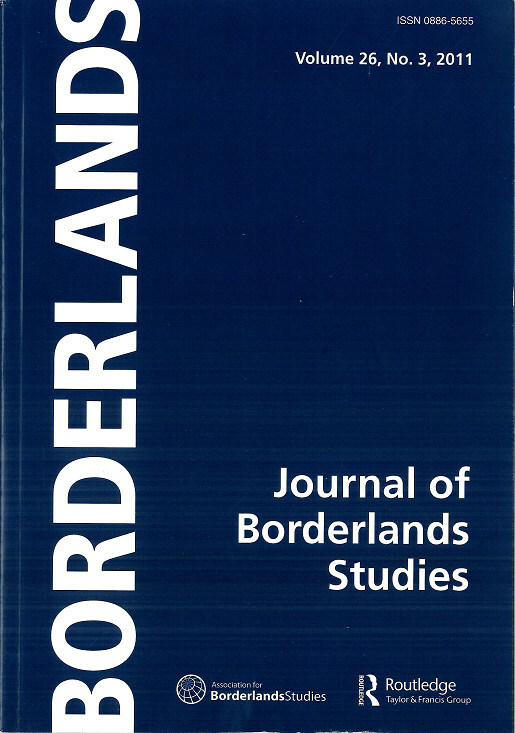 For full access to the Journal of Borderlands Studies (JBS) please sign in with your ABS account and visit our Members Area. If you do not have an account, please Become a Member. ABS will verify your membership and setup your account for full access to the JBS. Subscriptions to the Journal of Borderlands Studies are provided automatically to all paying members of the ABS. Pay your membership dues to receive your copies of JBS. The journal is indexed in the Hispanic American Periodicals Index. Click here to visit the ABS Self Care site, through which members have access to complete articles dating back to 1986.